I am constantly amazed and reminded of the most basic instinct in nature….survival. I have been watching the Discovery series titled North America over the past few weeks. If you haven’t yet seen it or would like to…tune into the Discovery Channel on Sunday night; the series has focused primarily on nature and the animals of our continent. A week ago the series played out an ongoing struggle between a mule deer fawn and a coyote; not only was I incredibly impressed with the cinematography of the show but by the instinct of this newborn fawn. Mr. Coyote was doing…well, what they do, looking for the next meal and as he got a whiff of the young deer he immediately went into a hunt and trailed the fawn. The mother tried her best to distract the coyote with a limp…but ole wily coyote would have nothing of it. Finally the fawn’s instinct to survive took over and it simply laid down into a small ball and remained motionless as the coyote tried repeatedly to locate the tasty morsel. While the show didn’t tell us…I have read and completely believe, that these newborns are totally free of any scent for about 24 hours and as it played out, the coyote finally became interested in a small rodent and took a ‘bird in hand’! What nerve the little fawn had to show and how nervous the doe must have been? While fishing down Sugar Creek a couple weeks back, I came upon a Wood Duck hen that put on one incredible show as she splashed, flogged and beat her way across the creek. Now this wasn’t my first rodeo and I knew all too well that she had young chicks and sure enough, just a few seconds after her Academy Award performance…about 10 little woody chicks moved quietly up the side of the creek in the other direction! Brilliant instincts by a critter that has a brain about the size of a ping pong ball? This past Sunday I took a long walk down one of my special creeks in search of Smallmouth Bass. The first hour was slow with just a few small fish…but as I neared one of the many spots where the creek flows under an old railway bed I used another basic instinct of nature, that of hunger to catch three nice smallies; 2 were almost 15 inches and one was a tad over 14. I have been surprised through my years of fishing to find various fish that were absolutely stuffed, but were still willing to eat more; seems like nature codes animals to get all they can while the getting is good. You might recall that a couple years back, while fishing on Island Pit in Minnehaha, I caught a nice bass and upon landing the fish found a frog of about 6 inches in its craw…the frog was still very much alive but this big old fish was putting on the feed bag and got caught doing so! Last year I was fishing in Hillenbrand when I landed a 7 pound bass that had a special surprise…about a 12 inch snake that poked its head out through the fish’s gills! Once again this fish was eating everything in sight. The past couple of weeks have served us some serious rain in our area and you would be totally surprised to so how much damage these mini flash floods do to these smaller creeks…I have seen some very large trees get swept away; and all of these usually wind up in large log jams. As I neared the first big contingency of logs, trees and trash I moved quietly out of the water and worked my way out onto one of these large and stable timbers. I stripped off a few feet of line and placed my crawfish pattern a few feet below and started to jig and bounce the fly through one of the deep holes created by the log-jam. 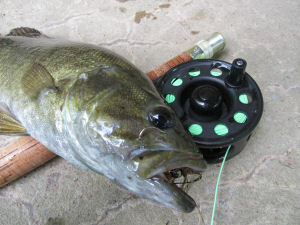 I had only been at it a few seconds when bang…a 15 inch smallie inhaled the fly; I clamped down on my fly-line and man-handled the powerful fish up and out of the water. I am sure that had you been looking on it would have looked like a bass fisherman slinging a bass into a bass boat…but I knew I had few options, if the fish made it to within the logs…I was finished. 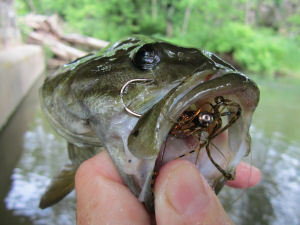 I snapped a few photos (you can see the fly and bass picture) and released him a few feet downstream. I carefully made my way back out onto my perch and once again started jigging this ‘tasty’ crayfish. Lightning struck two more times as I was able to haul another 15 inch fish and one just a tad smaller from a hole that was not much larger than a big bath tub. As I left and headed downstream I once again had to shake my head and laugh as these fish were noticeably healthy and whether they needed another a crawdad or not…their basic instincts took over and they fed. I am always appreciative of every chance I get to be in nature; to walk a small creek and catch a few fish is for me…as good as it gets. I hope that you too can and will give nature a chance as we all Enjoy the Great Outdoors.